6 for $73.50 total Need more quantities? Gorgeous ribbed and ruffled 6″ pink blooms add an indisputable grace to the summer garden. Winner of the Stout Medal from the American Hemerocallis Society. Daylilies are a gardener’s dream. They offer glorious flowers in every shade except blue, a long season of bloom (though individual flowers last but a day), and a robust disposition that makes them easy to transplant, easy to maintain, quick to multiply, and resistant to pests. Planted together in large numbers, they quickly crowd out weeds and make a carefree and colorful ground cover. We ship large, 2-year-old field-grown plants that usually bloom the first year. They will outperform lesser grades offered elsewhere. Of exceptionally easy culture, these long-lived stalwarts of the garden come in every hue but blue. Hardy, pest-resistant, and quick to multiply, Daylilies are ideal perennials with many landscape uses: as specimen plants in the garden or massed to stabilize a slope or to act as a carefree ground cover. Dwarf forms are good container subjects. Although each flower only lasts a day, the blooms open over a long period. 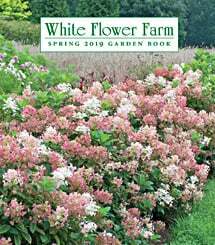 Early, mid-season and late varieties are available and by planting some from each group it is possible to have almost continuous bloom throughout the summer. Hybridizers continue to expand the list of reblooming varieties as well. Planting: When planting your bareroot Daylily, dig a hole deep and wide enough to accommodate the roots. Spread out the thick roots in the hole and place the plant so the crown—where the leaves meet the roots—is 1″ below the surface of the soil. Holding the crown of the plant, push soil into the hole, working soil around the roots. Firm the soil around the crown, pressing down with both hands. Light/Watering: Daylilies will grow in full sun in the North and will tolerate the same in the South with sufficient moisture. Plants grow well in partial shade, which is preferred for varieties with pastel flowers. Daylilies are drought-tolerant once established, but perform best with consistent moisture. Fertilizer/Soil and pH: These perennials prefer a well-drained loam with a pH approaching neutral. Soils rich in organic matter encourage profuse blooming, although many of the older hybrids will grow well even in a sandy situation. Fertilize lightly once the plants are established, but avoid using mixes high in nitrogen. A summer mulch is appreciated, since it will help soils retain moisture and buffer soil temperatures. Pests/Diseases: Daylilies rank high on the list of plants resistant to insects and diseases. Thrips occasionally feed on buds or flowers, distorting the blooms and causing cork-like lesions on the flower spikes, which may then break at the affected area. Use insecticidal soap to discourage these tiny pests, and remove and destroy any infested buds or flowers. Spider mites can infest the foliage during hot, dry weather; wash them off with a forceful water spray regularly, or use an appropriate insecticide. Yellowing leaves and brown leaf tips result from normal senescence after flowering; regular grooming will keep plants looking fresh. If foliage becomes unsightly, cut it back to the ground, water well, and in time new foliage will appear. Companions: Platycodon, Rudbeckia, Liatris, Shasta Daisy, and Echinacea are all fine companions for sunny situations; Ferns, Hosta, and Solomon's Seal are lovely with Daylilies growing in shadier spots. If you underplant Daylilies with Daffodils, the foliage of the former will hide the foliage of the latter as it dies back, and you'll get two gorgeous seasons of bloom from one area with very little maintenance. Reflowering: Many reblooming varieties are now available; these require regular removal of old flowers to perform at their best. On all types of Daylilies, spent flowers should be snapped off daily and the entire flower scape should be cut off after all buds have passed. Dividing/Transplanting: Daylilies should be divided every 3 to 5 years, and repeat-bloomers every two years since new growth supports the rebloom. Two spading forks held back-to-back and prised apart makes this chore easy. Transplant anytime the soil is workable, watering well after planting in the new location. End of Season Care: Simply remove old foliage by cutting back to the ground or pulling off. Daylilies are very cold hardy, with the exception of some evergreen varieties, so a winter mulch is little more than a nicety. Early Spring: Apply a light application of balanced or slow-release fertilizer low in nitrogen or side-dress with compost and organic amendments when new growth appears. Divide or transplant as necessary, watering well afterward. Mid-Spring: Water well if it is unseasonably dry, as plants prefer evenly moist soil. Late Spring: Remove spent flowers daily. Watch for flower thrips and treat accordingly. Summer: Continue to deadhead as needed, and cut away flower scapes after all buds have opened. Groom plants by removing yellow or dead leaves. Supplement natural rainfall to provide an inch of water a week, and apply 2–3 inches of mulch around plants, keeping it an inch or so away from the crowns. Monitor plants for spider mites and spray if needed. Fall: Remove old foliage by cutting back to the ground.